In PowerPoint 2016 for Mac and newer versions, once you've added a video to your presentation, you can add basic effects, trim the video, and choose how the video is played. Select the video you want to format. Click the Video Format tab on the ribbon. The video plays automatically when the slide appears. The video only plays when you click its Play button. The video plays in sequence with other actions you've programmed on the slide (such as animation effects). This option doesn't require a literal click. You can trigger the video to begin with a clicker or any other mechanism that activates the next action on the slide (such as pressing the right arrow key). If you want to give your video some extra style or formatting, you can do so with Video Effects. On the Video Format tab, click Video Effects. You can choose any number of effects to give your video more emphasis—Shadow, Reflection, Glow, Soft Edges, Bevel, or 3-D Rotation. You might want to remove parts of a video that are not pertinent to the message of your presentation. 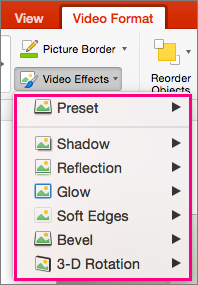 Use the Trim Video feature to trim away the beginning and/or end of your video clip. Important: You can only trim videos that you've embedded from your computer. The Trim option is not available for videos inserted from the web. In Normal or Outline view, select the video frame on the slide. On the Playback tab of the ribbon, click Trim Video. 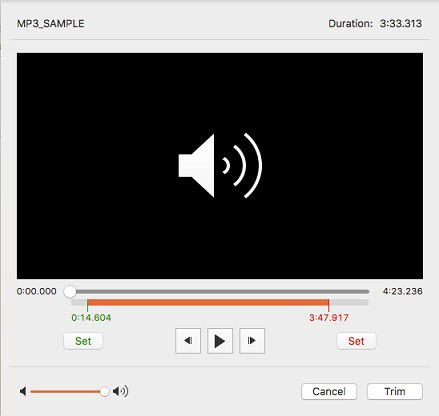 To determine where you want to trim your sound clip, click Play. You can use Next Frame and Previous Frame (adjoining the Play button) to fine-tune the location where you set a marker. To trim the beginning of the clip, click the green Set button on the left-hand side. To trim the end of the clip, click the red Set button on the right-hand side.